The film comes together with Allison (Jillian McWhirter) and Cheryl (Pamela Segall) starting college, and their first day of a class on the psychology of fear. After their professor (Ramy Zeda) goes too far with one lesson (scaring a macho frat guy to the point of wetting himself), he is forced to tone his class down, but opts for anyone who wants to get a better understanding of what he’s teaching to come to his house the next night for a private lesson. A handful of students show up, including Allison and Cheryl, yet Allison has a bad feeling about it all (well, we haven’t heard that one before!) and almost seems to be a bit psychic about it. (Believe me, it gets old quick.) Yet, that night, as a few students take turns telling stories to scare each other, the angry frat guy decides to get his revenge, and closes in on the party, as each story is told. 1: “The Old Dark House”- This one was really clever. It starts off and gets going with what seems like every cliche in hand. A couple takes the scenic route home, pass an old mansion where murders were committed, get a flat tire, and decide to go up to the house to call a tow-truck. We’ve seen all that before. But then, towards the end, the story takes a really creative twist that ties it all together perfectly, and actually proves to be a genuine surprise and thrill. 2: “A Night on the Town”- This one was a little thin, and could have used a few twists, yet it didn’t surprise you like it should have, which would have helped the flimsy plot. Four girls looking for some fun (one of which, Amy, I knew I recognized, and finally realized was the teenage girl in “Mr. Belvedere”!) and end up in the warehouse district of town with little gas. They stop at a gas station, and meet the gas station attendant from hell and his dobermans, which all proceed to terrorize the girls in a sometimes tense, sometimes cheesy chase through the wrong part of town. This one was not as good as the others, but still entertaining. 3: “All Night Messenger”-This one was pretty good, though a little typical. A woman, Alex, who works for a telephone messenger service (I didn’t get it, maybe this is pre-answering machine employment) comes home early from a ski trip with a broken ankle (hmm, will she have to run at some point?) and takes the late shift that night. She begins getting calls from a creepy caller for one woman, and when the woman comes home and calls for her messages, Alex tries to warn her before it’s too late. Of course, the caller eventually catches on, and makes his move, and you can sort of see where it all goes from there. Though, this one was pretty good, and the ending was creepy. The frame story eventually wraps up in this very bizarre climax that makes little sense at times, but it’s still creepy. And to wrap all that up, the movie does the only thing that might make some sense, but will surely make you groan with annoyance. Overall, I liked this. 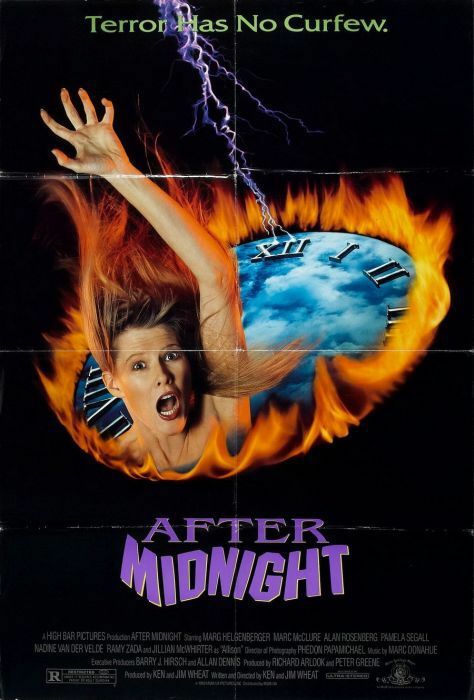 The main and end title music was creepy, and the whole atmosphere of the movie was that 80s horror movie feel that just sort of makes everything entertaining, and tolerably cheesy. The acting is all fairly typical. Jillian McWhirter sort of got on my nerves with all her damn premonitions, and she always looked really creepy, almost drugged. Ramy Zeda was a bit over the top, but creepy. I thought Pamela Segall was likeable, though, except, what was going on with her and the ending? (You’ll know what I mean if or when you see this, and if you have, tell me what was going on.) All the other actors were forgettable, and basically playing the roles expected of them in a movie like this. I recommend watching this if you get a chance. It moves quickly, and is really entertaining.